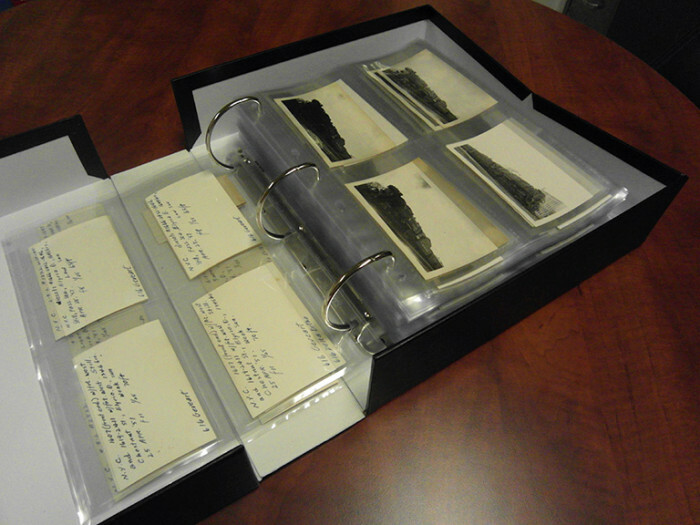 All 99 boxes and 55,000 color slides of the Center’s John F. Bjorklund Collection, a gift of his widow, Rose. Bjorklund wrote the location and date on the mount of every slide. The collection is a trove of information and imagery, dating from the 1960s to the 2000s and spanning the entirety of the United States and Canada. Photograph by Jeff Mast. The Center cares for more than 200,000 photographs in its Railroad Heritage Visual Archive. The Collections and Acquisitions Committee of the Center’s board of directors and executive director Scott Lothes oversee new acquisitions. Preservation activities take place both in house and in concert with the Lake Forest College Library Archives and Special Collections, which has a recognized heritage of stewardship of more than a century. The Library considers the Center “a partner in promoting its railroad photographic holdings,” which the Center amplifies with materials it has acquired from nationally-known railroad photographers together with non-photographic works of railroad art. The Special Collections division at Lake Forest processes and conserves collections, often with financial support generated by the Center, and cooperates with the Center in publication of all its railroad holdings. Archival work occurs daily in the Center’s office in Madison, Wisconsin, following the hire of Jordan Radke as full-time archivist in January 2015. Radke supervises graduate student interns from the University of Wisconsin-Madison’s School of Library and Information Studies. Utilizing facilities in both Madison and Lake Forest, the Center can handle multiple collections simultaneously to reduce backlogs and to ensure the processing of materials is up-to-date. Together the Center’s and Lake Forest’s collections have gained recognition as a nationally significant repository of railroad photography. Download the Center’s Collections Management Policy (206 KB PDF file), prepared by the Collections and Acquisitions Committee and adopted by the full board of directors in November 2014. 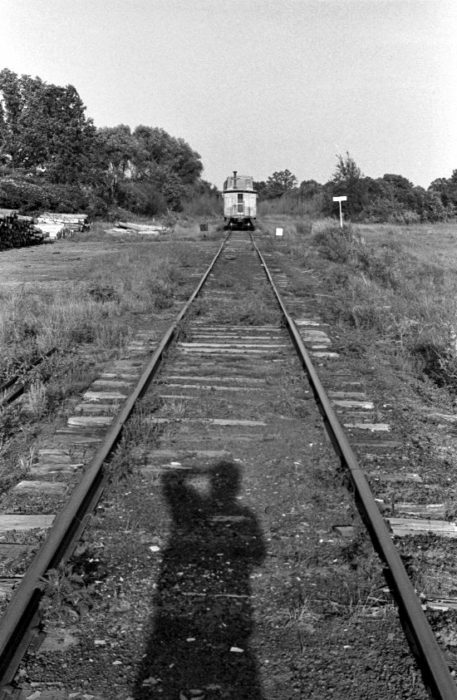 Many railroad photographers are deeply concerned about finding permanent homes for their work. If you are one of them, you may wish to consider the Center for Railroad Photography & Art, which has an active, selective acquisitions program through our Railroad Heritage Visual Archive. 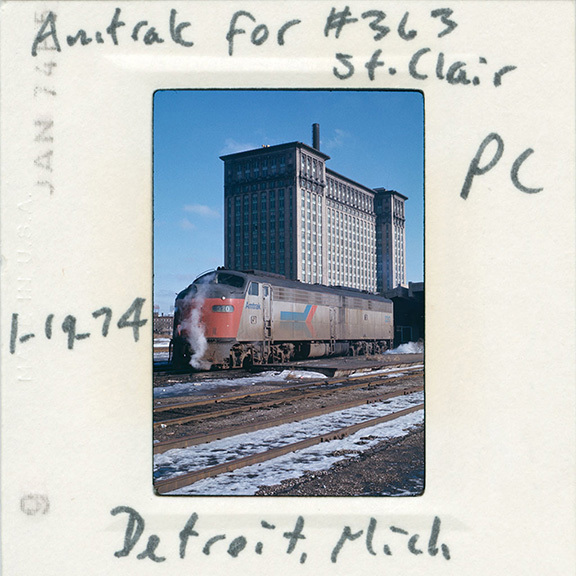 The Center currently cares for about 200,000 railroad photographs, both at our office in Madison, Wisconsin, and at the Archives and Special Collections of the Lake Forest College Library, our archival partner, in Lake Forest, Illinois. The staffs at both have strong histories of professionally archiving photographs, and also of presenting their holdings through publications, exhibitions, and conferences. Our interests span the world and the entire history of railroad photography, from the 1840s to today. Because there are huge numbers of railroad photographs and because a great deal of specialized and costly work goes into processing photographs professionally, the Center carefully reviews all offers of photography donations before deciding which ones to accept. The review and decisions are made by the Collections and Acquisitions Committee of the Center’s board of directors. Format(s): Slides, negatives, prints, etc. Before submitting, we recommend that you download a copy of our Collections Management Policy (206 KB PDF file). It provides valuable, additional information. Our Collections and Acquisitions Committee reviews all offers very thoroughly. Because the committee meets only four times a year, you may not receive a decision from us for three months or so. When we decide that we are not able to accept a collection, we make every effort to suggest other, often nearby institutions that photographers might pursue as a home for their work. Kodachrome slides from the Center’s Fred M. Springer (above) and John F. Bjorklund collections. The Center’s Railroad Heritage Visual Archive is a professional archive repository with collections housed at the Center’s office in Madison, Wisconsin, along with the Lake Forest College Library Archives and Special Collections in Lake Forest, Illinois. Led by Adrienne Evans, Archives Manager in Madison, and Anne Thomason, College Archivist and Librarian for Special Collections at Lake Forest, the Center’s collections receive professional archive treatment. The Center follows established archival principles, with Evans and Thomason supervising work performed by graduate interns, to ensure the more than 250,000 materials in our possession receive proper care. This is the initial planning phase for any collection where we get familiar with its materials. In this phase we will begin to organize the collection and create an inventory along with any information that can be used in a finding aid. What is the original order of this collection? What are the main groupings of this collection? This phase involves long, tedious legwork but is essential in the general preservation and accessibility of the collection. Once the collection is organized we can apply labels to binders and pages while correctly matching up the physical materials with a digital inventory that will include metadata. Are materials in archival safe housing? Can this collection be digitized? Metadata, or data about data, are necessary to fully understand the materials in our collections. At the Center we record detailed metadata and embed that raw data into any digitized materials. Once we have finished processing a collection we can create a detailed and cohesive finding aid. This is the best way for our users to understand the scope and content of a collection. Are all available metadata recorded? Are there any unique metadata fields attributed to this collection? Is the finding aid available online and beneficial to users? In the final phase, we strive to make our collections available to the public and searchable online via finding aids. Throughout the previous phases the Center will attempt to provide previews of collections online as they are processed. Can users find our collections online? Where can we make our collections accessible? Are the materials in our collections searchable? 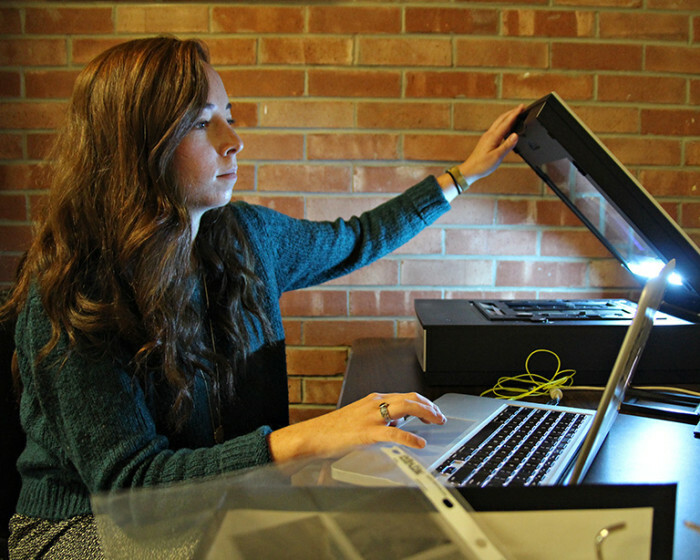 Maddie Shovers, a former graduate intern from the University of Wisconsin’s School of Library and Information Studies, scanning negatives from the Center’s Leo King Collection. Prints from the Perry Frank Johnson Collection after Center staff members and volunteers rehoused them into archival-safe pages and binders. Newly acquired office space in Madison, Wisconsin, provides additional storage for collections and room to research. The Center for Railroad Photography & Art provides public access to its collections via its services, digital collections, and archives. The bulk of our materials are digitzed and available for research and usage in various electronic formats. You can browse selected images from our collections on the Center’s website and Flickr account. Please contact info@railphoto-art.org with research inquiries and image requests. Familiarize yourself with the Center’s processing phases and the unique ID numbers that every image is assigned (i.e. Lamb-01-001-01). The Center uses these numbers to retrieve requested images. Please reference these ID numbers when making an image request. The Center can supply images in JPEG, TIFF, or RAW file format. The physical holdings of the Center for Railroad Photography & Art are available for research use by the general public at the Center’s office in Madison, Wisconsin. Most collections are available for viewing with staff supervision. Please note that materials do not circulate from our location nor are they available for loan. Please get in contact with the Center’s archives manager via email info@railphoto-art.org to schedule on-site research. In most cases the Center owns the copyright for the photographs in our collections. We are a non-profit organization and educational resource and therefore advocate for fair use of our images and typically offer them for free to other non-profits. To arrange for editorial and commercial usage, please send an email to info@railphoto-art.org with the details of your request. The Center does ask for the proper credit (see below) to recognize the photographer and the collection. We typically keep normal business hours of 9:00 a.m. to 5:oo p.m., Monday through Friday. Please check ahead of time to ensure that someone will be available to meet with you. 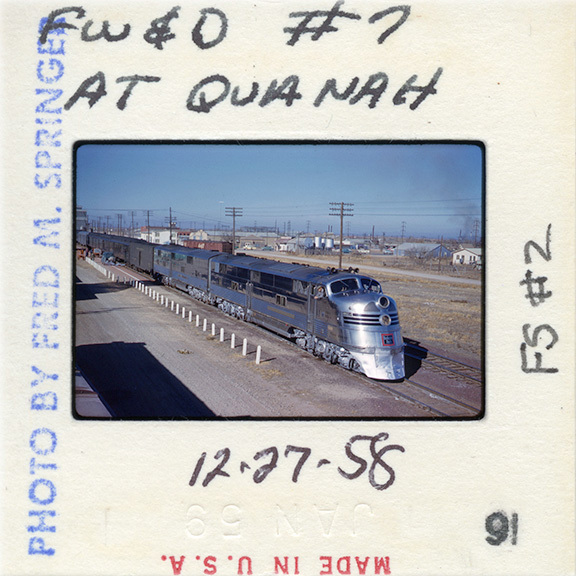 “Out of the Archives” is a regular column in Railroad Heritage that brings to light the world of professional archiving, providing a regular forum to share selections from the Center’s collections and tips for maintaining your own photographs. Whether you are a photographer, collector, or avid fan, it is important to organize and preserve the materials you create or collect. In this digital version of the column, we will be delivering every installment to further promote the significance and standards of the archiving world. Please get in touch with Jordan Radke, Archives Manager, jordan@railphoto-art.org, if there are any topics you would like us to cover in the future. The Center’s collections, comprising some 250,000 photographs, form the basis of our Railroad Heritage Visual Archive. The team in Madison, Wisconsin, consists of Adrienne Evans, Archives Manager, summer graduate archival interns and volunteers. We also partner with Lake Forest College, working with Anne Thomason, Archivist, along with graduate archival interns, to process and maintain Center materials housed in the college’s Archives & Special Collections in the Donnelley and Lee Library. Scott Lothes, Center president and executive director, and the Collections & Acquisitions Committee of the board of directors provide oversight. Preservation. 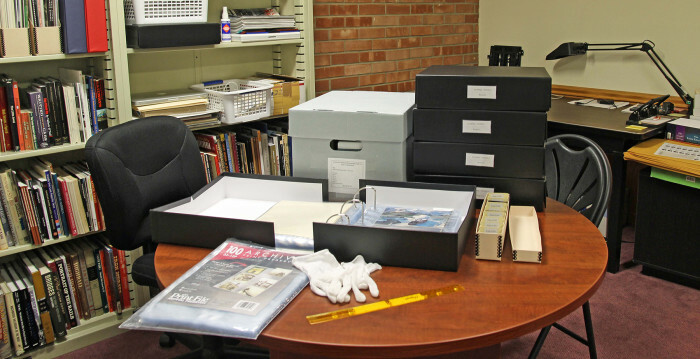 One of the Center’s main objectives is properly preserving our collections. This includes appropriately caring for and handling our materials by using archival-safe supplies, and providing a controlled environment where our collections are housed. Processing. Processing materials is a long, tedious, and detailed endeavor. Organizing a collection appropriately sets up the rest of the processing work that includes any digitization and metadata entry. This work is essential to the long-term care and future accessibility of a collection. Arrangement and Description. To maintain quick and easy retrieval of our materials, we organize every collection down to its individual items, if possible, given the time and resources available to us. Accessibility. Finally, the Center will make sure that users have access to our processed collections. We create detailed finding aids to describe each collection and its contents and share images electronically through our websites and many social media outlets. Why Scan What You Can Shoot?